Heat the oil and add the 2 laung, dalchini, and tej patta and kali mirch. When slightly darkened, add the ginger and saute over medium heat, till light brown. 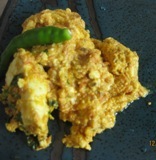 Add the khus khus paste, jeera and dhania, dahi, salt, chilli powder and stir-fry till the fat separates. Mix in the ground spices, and the cream and serve hot garnished with the hara dhania and almonds.